Feel the heated desert sand underneath your feet. Smell the clean, hot, sage-scented air as it fills your lungs, and look upward at walls covered with history — you’re standing in the very place the early beings of the desert lived. You’re at the River House Ruin. Located roughly 12 miles southwest of the small town of Bluff, Utah (pop. 320), near the scenic San Juan River, the River House Ruin is nestled into the west side of Comb Ridge. It’s home to an array of pictographs as well as a kiva and several one- and two-story rooms. 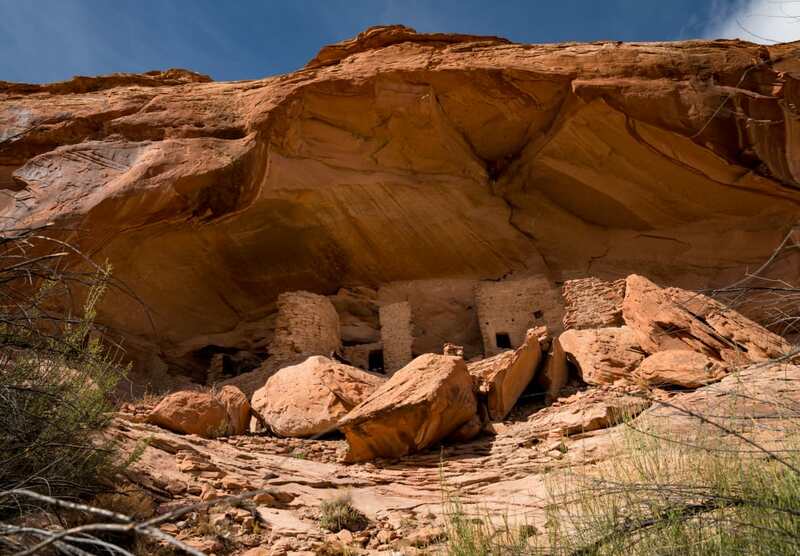 The site offers visitors a true taste of southern Utah’s storied history — ancient Pueblo ruins, pioneer history and stunningly preserved petroglyphs and rock art. The greater Cedar Mesa boasts a plethora of rock art and ancient ruins located on public lands. This means they can be visited with very few restrictions, offering a first-hand look at the history that shaped the rugged terrain. Depending on how much of the site you would like to explore, the largely flat trail is less than a mile, and it’s easy to make a quick trip to the site. 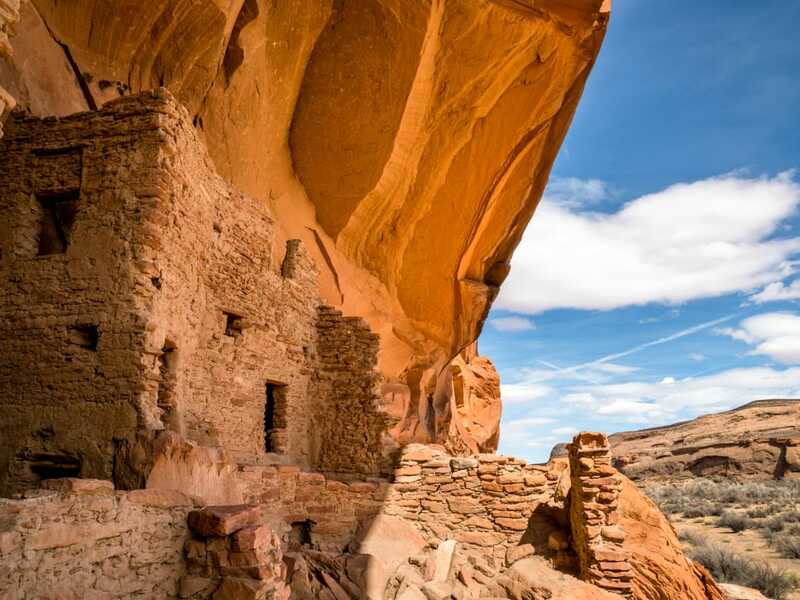 But, most people will spend upward of an hour exploring River House Ruin, as the cliff dwelling site and rock art are uniquely compelling in their own ways. The way into River House Ruin follows a portion of the route traveled in 1879 by a group of Mormon pioneers as they began the famed Hole-in-the-Rock Expedition. This same route treks through historic San Juan Hill and the Barton Trading Post. Nearly 140 years ago, this initial group of settlers traveled through the area on a mission to establish a farming community. After crossing the nearby Colorado River, they scaled the impressive San Juan Hill — not far from River House Ruin — with oxen and wagons, persevering onward in a classic tale of American history. In many places, you can still see the wagon wheel ruts from the heavily-loaded wagons. To experience this history firsthand, climb into your trusty four-wheel-drive vehicle and head to the site, 12 miles from Bluff and only 5 miles from the highway. (Deep sand and impressively rocky ruts require a vehicle capable of off-road driving. If you don’t have a four-wheel-drive vehicle, park and walk or bike the remainder of the way in.) The area is easily navigated. About a mile past San Juan Hill is River House Ruin. It is estimated these dwellings were occupied by the Ancestral Puebloans sometime between 900 and the late 1200s. In modern times, the ancient Pueblo people and their archaeological culture have been referred to as Anasazi. Historians note that the Navajo, who were not their descendants, called them by this term, reflecting historic traditions. 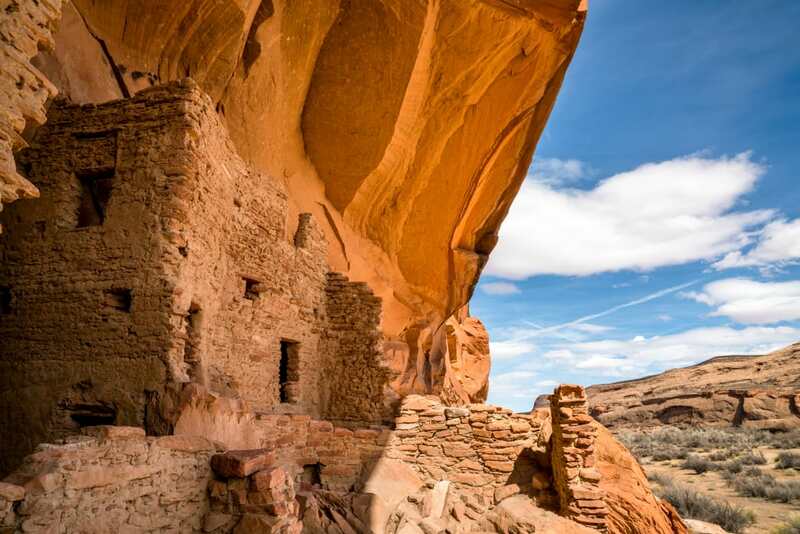 The term Anasazi was used to mean “ancient enemies,” and contemporary Puebloans prefer the term not be used. Exceedingly well preserved, River House Ruin is a great spot for families wanting to explore the area and expose children to its rich history. A mellow one-mile hike, suitable for nearly all skill levels, trails along the base of the sandstone cliffs and allows a first-hand look at hundreds of petroglyphs. The opportunity to explore these ruins with no supervision also comes with a responsibility. Ranger patrols are infrequent, and it is up to visitors to ensure they view and explore the sites without causing damage. Leave no trace means that it’s okay to take photos but don’t touch or disturb the artifacts. River House Ruin is home to a variety of rock structures, art, petroglyphs and other artifacts that have remained in place for decades. Don’t climb off the path. Don’t disturb the rocks, make rock “mountains” or rub chalk over the image — ensure this piece of history will remain for generations to come! It’s a good idea to have a talk with children beforehand to establish appropriate behavior and set boundaries. Regardless of how you choose to experience River House Ruin, it promises to be an illuminating experience. Take a moment to look out over the desert landscape, breathing in the hot, dry air, feeling the sun soaking into your skin, and marvel at the strength of those who came before. The desert truly is a remarkable landscape, and those who crafted their lives in it were even more remarkable. Written by Jess McGlothlin for RootsRated Media in partnership with Utah Office of Tourism.